The crowd at the base of the Queensboro Bridge tries to catch a glimpse of the lead men's pack as it flies down First Avenue. I shot the New York City Marathon last weekend for the combined Runner’s World/Running Times coverage of the race and the events surrounding it. 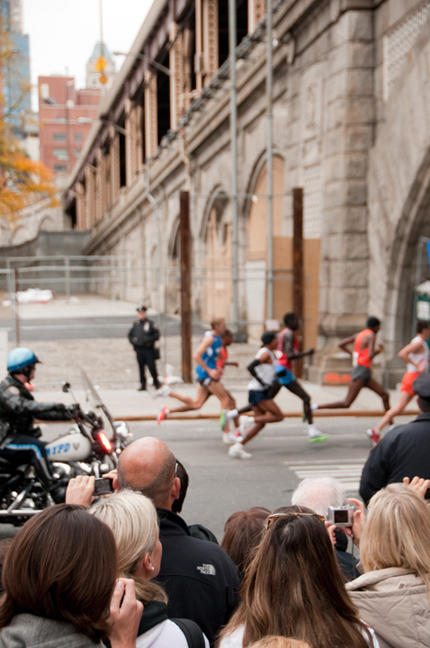 Much like I did for the Boston Marathon, I shot and compiled several online slideshows. And much like Boston, it was a rewarding, but exhausting weekend. Okay, maybe a little more trying than Boston, given some ludicrous circumstances that I won’t bore you with, but that involve a certain hotel with a lousy Internet connection and lung-searing fresh paint fumes! ANYWAY…back to the race. I started out at 58th Street and First Avenue where the runners first come off the Queensboro Bridge and enter Manhattan at mile 16 of the race. I’ve been at this spot in the past and even as a person who shies away from noise and crowds (such a natural choice I am for covering a 40,000-person race in the fourth-most-populated city in the world! ), I never tire of the roar that erupts at this spot as runners come off that bridge. Almost makes me want to run the race. ALMOST, I said. How cool is it that all these strangers are cheering for you? You must feel like the biggest hero in the world when you hear that crowd. 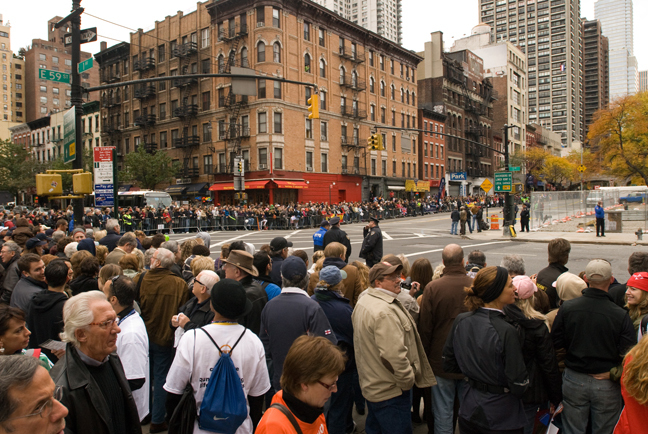 The swarm of people that boisterously welcomed runners coming into Manhattan. One of several Maasai runners in the race added even more color to an already dazzling foliage display. Next I jumped on the subway and headed uptown to the east side of Central Park. It was actually much easier to get around than I thought it would be based on past experience. The crowds were thin between miles 24 and 25 of the course (a great place to watch if you don’t want to fight your way through mobs of people, but still want to be relatively close to the finish). 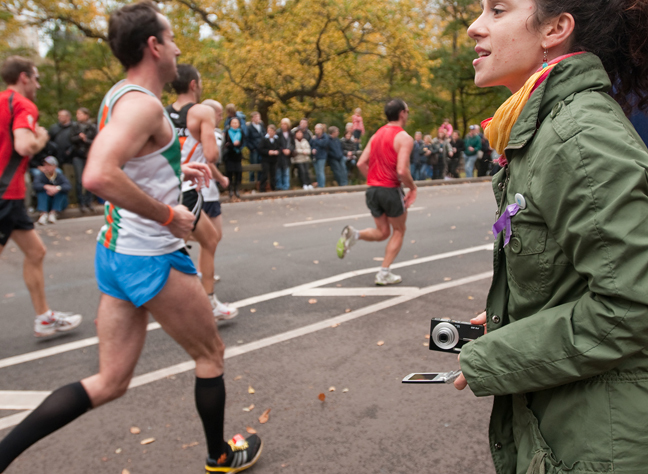 The two most important tools for friends and families of marathoners: a phone and a camera. Then it was on to the finish, well, with a slight detour. I meant to head toward the finish but actually wound up near Columbus Circle, which is the half-mile-to-go point. (One of these years I’ll know where all those windy paths in Central Park go!) The crowds at Columbus Circle have been difficult to navigate in the past, but again, it was surprisingly sparse here so I took some shots before heading on to the finish area. This is where I met the inspirational “pan man” from Yankee stadium. Freddy, you rule. Runners in the final half mile of the marathon cruise toward the finish in Central Park. Eight or so blocks past the actual finish, where the runners file out of the park to meet their loved ones, I was meeting a fellow journalist who was going to help take down some information about the runners I was photographing for the Faces at the Finish slideshow. I calculated I had a half hour or so to take some shots in the immediate finish area before I was so late that he would hate me. It was a great spot to capture people in a range of post-marathon emotions…euphoria, exhaustion, misery and most frequently, relief. 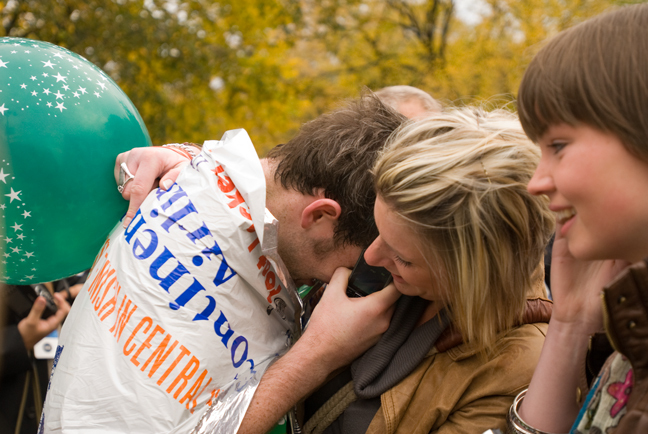 The marathon can reduce even grown men into weeping babes, as demonstrated by Desmond Henderson of Ireland who sunk tearfully into a loved one's arms post-finish. I’ve never seen so many spent looking people in one place, both physically and emotionally. It really drove home how hard running that far is (at least if you are doing it at a decently fast pace). Not that I would know. A lot of people ask me when I am photographing events like this if I’m a runner. Many say “you look like a runner.” (And let me tell you, that is not a compliment. They might as well say “you have a flat chest, cavernous eye sockets, dangerously sharp cheekbones and a hard gaze.”) But I’m not a runner. Not really anyway. I often say “I used to be” because to me being a runner means competing in running events, which I did in high school and my first year of college and then sporadically afterwards until I took up cycling, which is now my sport of choice. My fragile frame has a hard time enduring the toll pounding the pavement takes. But I still know the euphoric feeling running can bring. And its pain and disappointments as well. Photographing this range of emotions is a way for me to live vicariously through people who are able to run 26.2 miles. And for that I am grateful. 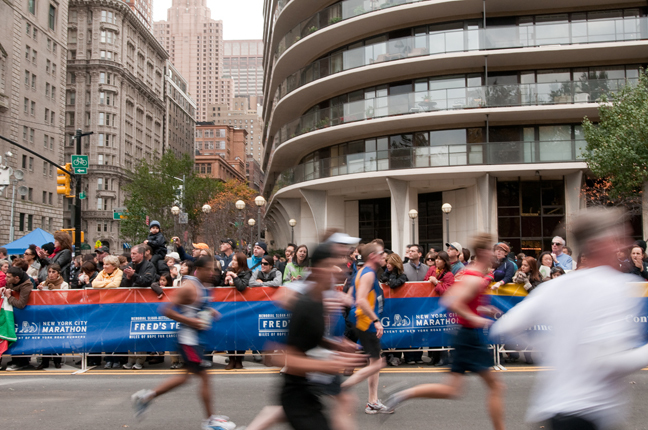 This entry was posted in running and tagged New York City Marathon, Runner's World, Running Times on November 6, 2009 by Stacey Cramp.